We will consider the usage of two form security elements provided by Zend Framework 3: Captcha and Csrf (both classes belong to Zend\Form\Element namespace). By adding those elements to your form model (and rendering them in a view template), you will make your form resistant to hacker attacks. A CAPTCHA (stands for "Completely Automated Public Turing test to tell Computers and Humans Apart") is a challenge-response test used in web sites for determining whether the user is a human or a robot. There are several types of CAPTCHA. The most widely used one requires that the user type the letters of a distorted image that is shown on the web page (see figure 11.1 for some examples). Some secret sequence of characters (word) is generated server-side. The secret word is saved in a PHP session variable. The distorted image is generated based on the secret word. The image is then displayed on the web page to site user. The site user is asked to type characters shown on the image. If the characters typed by user are the same as the secret word saved in the session, the test is considered passed. The goal of the CAPTCHA test is to protect your form from filling and submission by an automated process (so called robot). Usually, such robots send spam messages to forums, hack passwords on site login forms, or perform some other malicious actions. The CAPTCHA test allows to reliably distinguish humans from robots, because humans are easily able to recognise and reproduce characters from the distorted image, while robots are not (at the current stage of evolution of computer vision algorithms). Dumb. 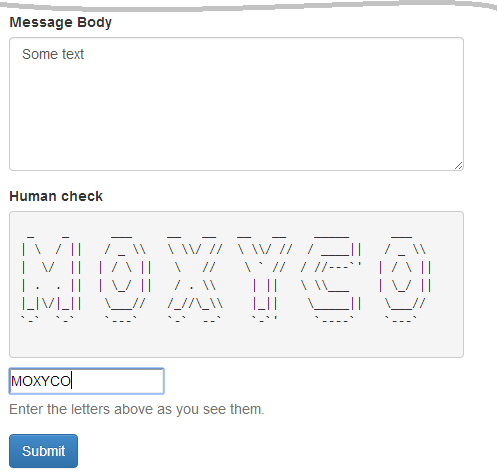 This is a very simple CAPTCHA algorithm which requires that site user enter the word letters in reverse order. We will not consider this type in details here, because it provides too low protection level. Image. A CAPTCHA algorithm distorting an image with addition of some noise in form of dots and line curves (figure 11.1, a). Figlet. An unusual CAPTCHA type using FIGlet program instead of an image distortion algorithm. The FIGlet is an open-source program which generates the CAPTCHA image of many small ASCII letters (figure 11.1, b). The Zend\Captcha component provides a unified interface for all CAPTCHA types (the AdapterInterface interface). The AbstractAdapter base class implements that interface, and all other CAPTCHA algorithms are derived from the abstract adapter class 45. The class inheritance diagram is shown in figure 11.2 below. 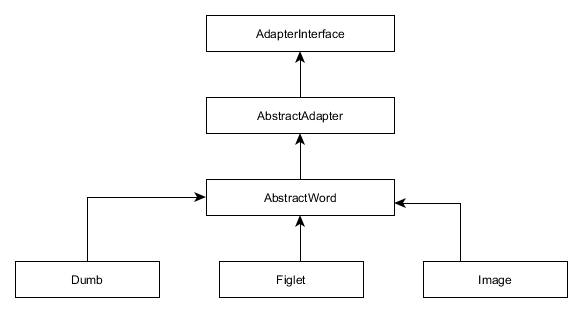 45) The adapter is a design pattern that translates one interface for a class into a compatible interface, which helps two (or several) incompatible interfaces to work together. Typically, CAPTCHA algorithms have different public methods, but since they all implement AbstractAdapter interface, the caller may use any CAPTCHA algorithm in the same common manner (by calling the methods provided by the base interface). As you can see from the figure 11.2, there is another base class for all CAPTCHA types that utilize some secret word of characters: the AbstractWord class. This base class provides methods for generating random sequence of characters and for adjusting word generation options. ZF3 provides the dedicated form element class and view helper class for letting you use CAPTCHA fields on your forms. To add a CAPTCHA field to a form model, you use the Captcha class that belongs to Zend\Form component and lives in Zend\Form\Element namespace. The Captcha element class can be used with any CAPTCHA algorithm (listed in the previous section) from Zend\Captcha component. For this purpose, the element class has the setCaptcha() method which takes either an instance of a class implementing Zend\Captcha\AdapterInterface interface, or an array containing CAPTCHA configuration 46. By the setCaptcha() method, you can attach the desired CAPTCHA type to the element. 46) In the latter case (configuration array), the CAPTCHA algorithm will be automatically instantiated and initialized by the factory class Zend\Captcha\Factory. You add the Captcha element to a form model as usual, with the add() method provided by the Zend\Form\Form base class. As usual, you can pass it either an instance of the Zend\Form\Element\Captcha class or provide an array of configuration options specific to certain CAPTCHA algorithm (in that case, the element and its associated CAPTCHA algorithm will automatically be instantiated and configured by the factory class). The type key of the array (line 4), as usual, may either be a fully qualified class name of the element (Zend\Form\Element\Captcha) or its short alias ("captcha"). The name key (line 5) is the value for the "name" attribute of the HTML form field. The options key contains the options for the attached CAPTCHA algorithm. The class key (line 9) may either contain the full CAPTCHA class name (e.g. Zend\Captcha\Image) or its short alias (e.g. "Image"). Other, adapter-specific, options may be added to the key as well. We will show how to do that a little bit later. It is assumed that you call the view helper inside of your view template. Next, we provide two examples illustrating how to use different CAPTCHA types provided by ZF3: the Image and Figlet. We will show how to add a CAPTCHA field to the feedback form that we used in examples of the previous chapters. 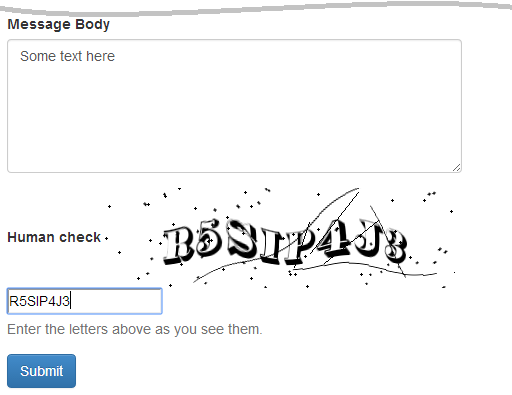 Image CAPTCHA requires that you have PHP GD extension installed with PNG support and FT fonts. the class parameter (line 21) should be either the fully qualified CAPTCHA adapter class name (\Zend\Captcha\Image) or its short alias (Image). the imgDir parameter (line 22) should be the path to the directory where to save the generated distorted images (in this example, we will save the images to the APP_DIR/public/img/captcha directory). the suffix parameter (line 23) defines the extension for a generated image file (".png" in this example). the imgUrl parameter (line 24) defines the base part of the URL for opening generated CAPTCHA images in a web browser. In this example, site visitors will be able to access CAPTCHA images using URLs like "http://localhost/img/captcha/<ID>", where ID is a unique ID of certain image. the imgAlt parameter (line 25) is an (optional) alternative text to show if CAPTCHA image can't be loaded by the web browser (the "alt" attribute of <img> tag). the font parameter (line 26) is the path to the font file. You can download a free TTF font, for example, from here. In this example, we use Thorne Shaded font, which we downloaded and put into the APP_DIR/data/font/thorne_shaded.ttf file. the fsize parameter (line 27) is a positive integer number defining the font size. the width (line 28) and height parameters (line 29) define the width and height (in pixels) of the generated image, respectively. the expiration parameter (line 30) defines the expiration period (in seconds) of the CAPTCHA images. Once an image expires, it is removed from disk. the dotNoiseLevel parameter (line 31) and lineNoiseLevel parameter (line 32) define the image generation options (dot noise level and line noise level, respectively). Above, the mkdir command creates the directory, and chown and chmod commands set the Apache user to be the owner of the directory and allow the web server to write to the directory, respectively. Now, if you open the "http://localhost/contactus" page in your web browser, the CAPTCHA image will be generated based on a random sequence of letters and digits saved in session. You should see something like in the figure 11.3 below. When you fill the form fields in and press the Submit button, the letters entered into the Human check field will be transferred to server as part of HTTP request. Then, on form validation, the Zend\Form\Element\Captcha class will compare the submitted letters to those stored in PHP session. If the letters are identical, the form is considered valid; otherwise form validation fails. <img width="350" height="100" alt="CAPTCHA Image"
the class parameter (line 11) should be either the full CAPTCHA adapter class name (\Zend\Captcha\Figlet) or its short alias (Figlet). the wordLen parameter (line 12) defines the length of the secret word to be generated. the expiration parameter (line 13) defines the CAPTCHA expiration period (in seconds). Now, open the "http://localhost/contactus" page in your web browser. Once that is done, you should see a page like in the figure 11.4 below. To better understand how this attack works, take a look at figure 11.5. You log into your account at payment gateway web site https://payment.com. Please note that the SSL-protected connection (HTTPS) is used here, but it doesn't protect from such kind of attacks. Typically, you set check on the "Remember Me" check box of the login form to avoid entering user name and password too often. Once you logged in to your account, your web browser saves your session information to a cookie variable on your machine. On the payment gateway site, you use the payment form https://payment.com/moneytransfer.php to buy some goods. Please note that this payment form will later be used as a vulnerability allowing to perform the CSRF attack. Next you use the same web browser to visit some website you like. Assume the website contains cool pictures http://coolpictures.com. Unfortunately, this web site is infected by a malicious script, masqueraded by an <img src="image.php"> HTML tag. 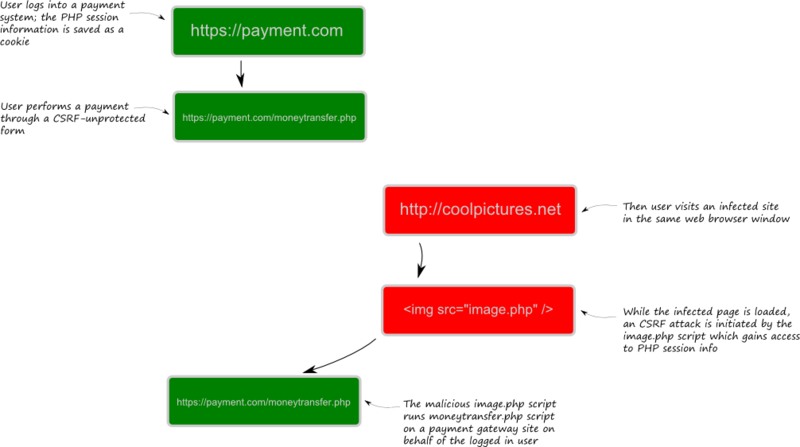 Once you open the HTML page in your web browser, it loads all its images, thus executing the malicious image.php script. The malicious script checks the cookie variable, and if it presents, it performs the "session riding" and can act on behalf of the logged in user. It is now able to submit the payment form to the payment gateway site. The above described CSRF attack is possible it the web form on the payment gateway site does not check the source of the HTTP request. The people who maintain the payment gateway site must put more attention in making its forms more secure. For certain form, generate a random sequence of bytes (token) and save it server-side in PHP session data. Add a hidden field to form and set its value with the token. Once the form is submitted by the user, compare the hidden value passed in the form with the token saved server-side. If they match, consider the form data secure. If a malicious user will try to attack the site by submitting the form, he will not be able to put right token in the form submissions, because the token is not stored in cookies. In Zend Framework 3, to add a CSRF protection to your form model, you use the Zend\Form\Element\Csrf form element class. The Csrf element has no visual representation (you will not see it on the screen). Above, we use the Form's add() method (line 2), to which we pass a configuration array describing the CSRF element. The element will be automatically instantiated and initialized by the factory. In line 3, we specify the class name for the CSRF element. This either may be the fully qualified class name (Zend\Form\Element\Csrf) or a short alias ("csrf"). In line 4, we set the "name" attribute for the element. In this example, we use "csrf" name, but you may use any other name, on your choice. In line 6, inside of csrf_options array, we specify the options specific to Zend\Form\Element\Csrf class. We set the timeout option to 600 (look at line 7), which means the CSRF check expires in 600 seconds (10 minutes) after form creation. As you can see from the HTML markup code above, the form now contains a hidden field with a randomly generated token. Since the attacker script doesn't know this token, it won't be able to submit its correct value, thus the CSRF attack becomes prevented. What happens if CSRF element validation fails? If during the form validation the CSRF check fails, the form is considered invalid and the user will see it again to fix input errors, but he won't see the error message for the CSRF element (we don't want hackers to know for sure what's wrong with the form).